eBay Inc.’s organizational culture is a business response to the dynamics of the online retail market and the e-commerce industry environment. The company utilizes its corporate culture as a strategic tool to promote effectiveness in the global trading/marketplace platform, auction and classifieds website operations, and related services. Effectiveness contributes to competitive advantages that are essential to addressing the forces identified in the Porter’s Five Forces Analysis of eBay Inc. A firm’s organizational culture or corporate culture defines the values, customs and traditions that guide employees’ decisions and shape their mindsets and behaviors. In this case of eBay’s corporate culture, results orientation is emphasized as a crucial aspect of human resource development and management. The company also pushes for holism in how workers fulfill their jobs and affect others through the Internet and other media. Thus, eBay’s corporate social responsibility (CSR) strategy is culturally supported. For example, cultural attributes influence employees to consider all aspects of the organization, including subsidiaries like StubHub and Kijiji, and all aspects of the business environment, including consumers and sellers/vendors. The company’s organizational culture is a pillar for long-term success in the rapidly changing e-commerce landscape. eBay’s corporate culture guides managers in developing strategies that enhance human resources and address challenges in e-commerce. For example, the company’s cultural values encourage results-based effectiveness in the online marketplace platform business. Cultural features help fulfill eBay Inc.’s corporate mission and vision statements. For instance, the corporate culture ensures that the company’s multinational presence attracts merchants and buyers. This condition addresses competition against Amazon, Etsy, Walmart Marketplace, Alibaba, Rakuten, and other players in the industry. Through corresponding behavioral characteristics of employees, the company strategically uses its organizational culture for profitable business performance. Excellence. Excellence is a core cultural characteristic of eBay. The company believes in the importance of extraordinary human resources in strategically growing an extraordinary e-commerce business. In this way, the organizational culture contributes to the business strengths shown in the SWOT analysis of eBay Inc. For example, excellence in employee performance leads to effective services that attract consumers and merchants to the company’s online retail/auction platform and classifieds websites. In implementing this attribute of the corporate culture, human resource management programs motivate workers to achieve and maintain excellence in supporting the company’s marketplace/trading platform and related operations. Results Orientation. Aside from excellence, eBay also applies results orientation in its organizational culture. This cultural trait encourages workers to focus on the target results of the online marketplace, classifieds and ticket exchange business, and make decisions to achieve those results. For example, with a holistic approach, eBay Inc. motivates employees to maximize their results by considering each other and customers, aiming for positive tangible impact on individuals all over the world. The company uses its corporate culture to strategically manage the effects of competitors, such as Newegg, Bonanza, Ruby Lane, eBid, and eCrater, and to address challenges linked to the online nature of the business. Inclusion and Diversity. eBay’s organizational culture promotes a diverse workforce and an inclusive workplace. This cultural characteristic leads to diversity in workers’ training and skills suited to the challenges in online retail, classifieds, and ticket exchange operations. Also, inclusion promotes high employee morale. The company encourages employee behaviors that contribute to a wealth of ideas. For example, inclusion and diversity enables creativity in addressing the industry trends outlined in the PESTEL/PESTLE analysis of eBay Inc. Thus, the company’s organizational culture facilitates management decisions and strategies for improving resilience in global e-commerce business. Advantages. An advantage of eBay’s corporate culture is the emphasis on results-oriented excellence, which motivates employees to exceed strategic expectations. This cultural trait helps satisfy goals for growing the multinational e-commerce business. Such excellence supports eBay’s generic competitive strategy and intensive growth strategies. Another advantage of the company’s organizational culture is that it promotes diversity and inclusion that boost performance. For example, managers use these cultural factors to improve workers’ morale and the company’s innovation. Innovation improves the competitiveness of the company’s online trading and classified listings websites and relates services. Disadvantages. A disadvantage or weakness of eBay Inc.’s organizational culture is the lack of emphasis on continuous learning. Continuous learning is a cultural characteristic that improves innovation at the employee and organizational levels. Another disadvantage of the company’s corporate culture is the limited cultural emphasis on speed and efficiency. These factors are needed to ensure the strategic responsiveness of the business to problems experienced in the international markets for online retail/auction trading, classified listings, and ticket exchange. Add cultural emphasis on continuous learning to support continuous business improvement and to keep the company abreast of the latest technologies. Add cultural emphasis on speed and efficiency, which are essential to e-commerce competitiveness. 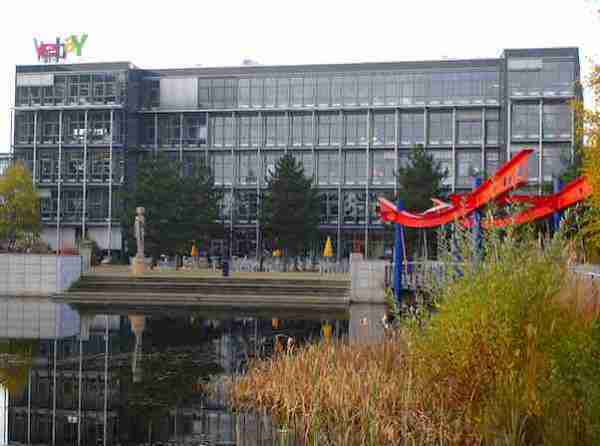 eBay Inc. – Diversity and Inclusion. eBay Inc. – eBay Appoints Damien Hooper-Campbell to Serve as Chief Diversity Officer. Hashemi, M. S. (2016). The effect of infrastructure, corporate culture, organizational structure and information technology on Competitive Intelligence in Organizations. Human Resource Management, 3(3), 43-50. Wenig, D. (2016). One Year In, Building eBay for the Future.